Today’s Le Bella Donna bride is Christina. 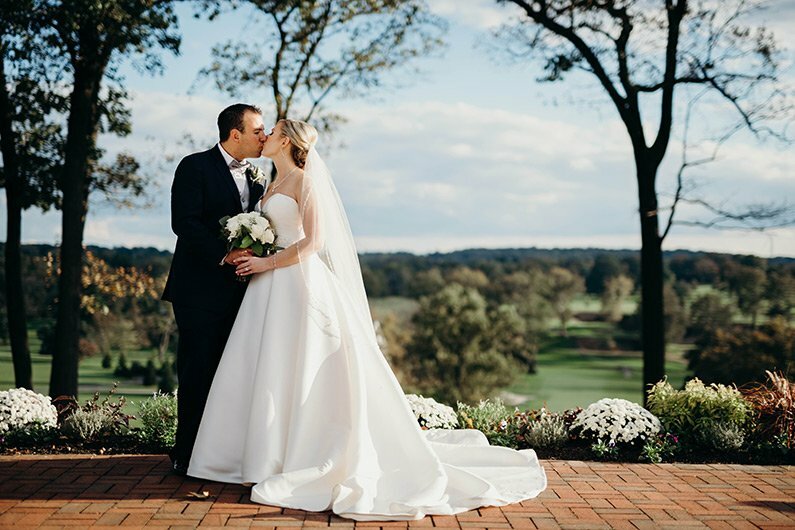 She married her husband Stephen last October at St. Alphonsus Catholic Church in Maple Glen, with the wedding reception at Manufacturer’s Golf and Country Club in Fort Washington. Christina wore a gorgeous, classic Essence of Australia gown. Christina and Stephen met in high school through mutual friends. They remained friends all throughout college, despite going to different schools. They had a very close friendship and their friends made a bet that they would get married, which at the time they thought was just a funny joke. In 2017, Christina and Stephen took a vacation to Mexico, which turned out to be an unusually rainy one. They spent most of their days hanging out by the pool, and that’s what Christina was doing when she fell asleep and Stephen disappeared to their room. He woke her up and said they should go back to their room for a drink on the balcony. When they returned to their room, Stephen put on the song “Make You Mine” by High Valley and proposed! The room had been decorated with rose petals and Stephen had gotten strawberries and champagne. Before she began shopping for her wedding dress, Christina kept a very open mind about trying on dress styles. She didn’t want a very detailed dress, but was still open to trying them. Though she knew what was popular, she really wanted to get something different and something that felt special to her. Christine’s favorite part of shopping for her gown was getting to try all of the different styles and fabrics. She says that “sometimes you don’t know that you love something until you have it on.” She knew her dress was the one when she turned around and saw the reactions of her mom, future sister in-laws, and best friends. She had already loved the dress, but that sealed the deal! Before their own wedding, Christine and Stephen had attended dozens of weddings for all of the people in their lives. They had a display with all of the photos they had from those weddings and at the end of the night, they took a photo with all of those other couples. Christina’s favorite part of her special day was seeing Stephen’s face when she first walked into the church. She felt so much love and excitement in that moment; her heart melted. The advice Christina has for other brides is to be open minded and know that things will go wrong. Despite any mishaps that may occur, focus on the love and the amazing things to come. Congratulations Christina and Stephen! We wish you many years of love and happiness together!